In the year 2003, in the German newsgroup someone looked for an application to combine several PDF files easily. So this application was created. Over the years the software got a lot of attention. Version 5.0 should address the most common feature requests from our survey in 2009 to make this the best Combine PDF version ever. About the PDF boxes: Every page has a different sizes depending on what area was defined to create it, how large it is used for content or where it is suggested to be cropped. Most users can live with default values here. Since 2011 our application is availble in the App Store. Drag and Drop files from Finder directly into the pages list on the position you like to insert them. Apply filters like compress pictures, gray tone and others. Beta version: CombinePDFsBeta.dmg with changes to restore font selection for overlays. Version 4.x fails on Mac OS X 10.7 Lion, but version 5.x works fine. License keys are delivered per email within a few minutes. VAT only applies to users from the European Union. If you have problems with Share-It, you can contact us for paying with invoice and wired bank transfer or by Paypal: Euro and US Dollar. Please use the right amount and add 19% VAT if you are from Germany. Only for Mac OS X? Users request this nice application to become available for Windows. But this is not possible as Microsoft does not include such nice PDF libraries with their operating systems. You can try the application A-PDF Merger for Windows. This application uses the PDF libraries of the Mac OS X version you have. Depending on which version you have some bugs may show. 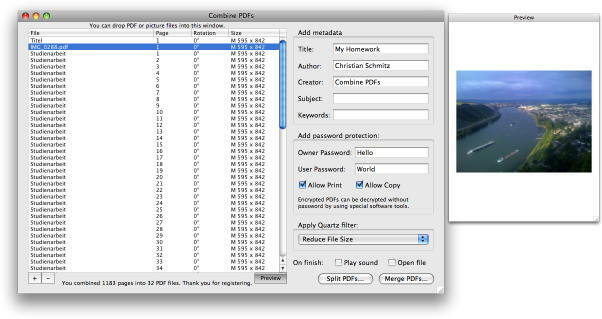 PDF files may miss parts of the content or may not be searchable. This can only be fixed by reporting the bugs to Apple so they can fix their CoreGraphics PDF handling. Please test all PDF files you create whether they look okay to you. Also be aware that PDF data with CMYK colors may not look perfect. Version 5.2.5 has a preference to enable DynaPDF as an alternative PDF engine. This one does not support all features, but sometimes works better with annotations.